At just 25 years of age, UFC Featherweight Champion Max Holloway is well on his way to carving out a path as an all-time great in the sport of mixed martial arts. Holloway, who is now 15-3 in the UFC since making his debut back in 2011, is currently riding a 12-fight win streak, which is the fifth-longest streak in the UFC's history after Anderson Silva, Demetrious Johnson, Georges St-Pierre, and Jon Jones. And it doesn't look like his streak will be stopping anytime soon. Holloway made his UFC debut at UFC 143 on extremely short notice against Dustin Poirier as a 19-year-old and was submitted quickly in the first round. Although his tall frame and long limbs showed he had some potential, the loss to Poirier didn't show much, and based on that fight it was hard to see him becoming the dominant champ he now is. Wins over Pat Schilling and Justin Lawrence boosted Holloway's confidence, as well as the opinion what fans and media thought about him, but a controversial split decision win over journeyman Leonard Garcia wasn't a good look. However, at the end of the day it was a win, and it did earn him a step up in competition. He likely should have won a decision over Dennis Bermudez at UFC 160, but he lost a split nod, and the UFC then fed him to emerging star Conor McGregor at UFC Fight Night 26, in a fight that saw McGregor take Holloway down at will and beat him up. That was in the summer of 2013, and that's the last time Holloway lost a fight. 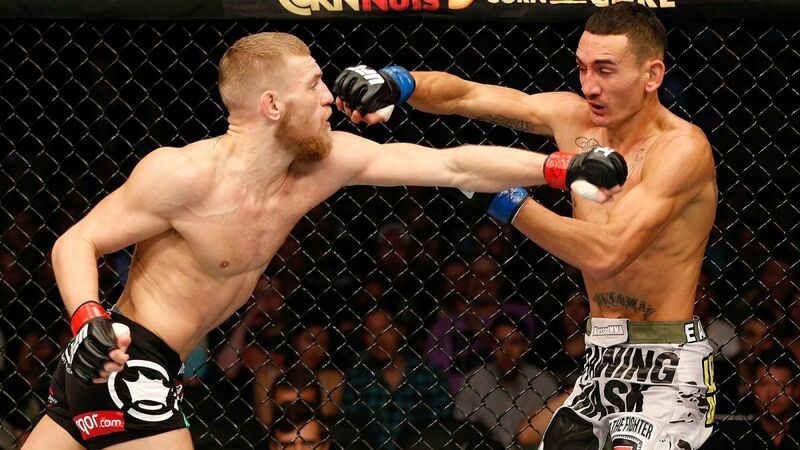 After the back-to-back defeats to Bermudez and McGregor, Holloway has been on a roll since. It really is unbelievable how much he's turned his career around since that lopsided loss to a one-legged McGregor, but it's a testament to Holloway's natural talent and his ability to improve. Wins over Will Chope, Andre Fili, Clay Collard, Akira Corassani, and Cole Miller earned Holloway a big step up in competition against Cub Swanson, and after destroying Swanson at UFC on FOX 15, it was clear Holloway was taking his game to another level. A freak finish over Charles Oliveira in his first headlining act got him a fight against Jeremy Stephens on the UFC 194 main card, and he won that fight as well, leading to a memorable matchup against Ricardo Lamas at UFC 199, another win for Holloway. With nine straight wins the UFC could not deny him a chance to compete for a title any longer, and he took on Anthony Pettis at UFC 206 for the interim featherweight strap, knocking out the former lightweight champion to win the belt and show the world he had arrived as an elite fighter. Winning the interim featherweight belt gave Holloway the chance to fight legend Jose Aldo to unify the featherweight title at UFC 212, and he thrashed Aldo via third-round TKO in his home country of Brazil to become the undisputed featherweight champion. The UFC then booked Holloway against Frankie Edgar at UFC 218 in what would have been his toughest test since McGregor, but Edgar got hurt and Holloway fought Aldo again, once again finishing him via third-round strikes, and showing the first fight wasn't a fluke. The second win over Aldo gave Holloway his 12th-straight win, and he's now clearly one of the top five pound-for-pound fighters in the sport. The crazy thing about Holloway is that he's only 25 and has his whole career ahead of him; he's just getting started. While the talk about him surpassing Aldo as the featherweight GOAT is likely a bit premature despite his two wins over the longtime champ -- and Holloway himself dismissed it -- he's on track to take that crown. And as he continues to win fights, he'll continue to move up the list of the sport's greatest all-time fighters. He's not there yet, but he's getting close, and considering how he looks better and better every time he fights, he'll likely be there sooner than later. Max Holloway is an incredible talent and he hasn't even reached his physical prime yet, which is scary. He continues to show improvement and evolution in his game every time he fights, and he will continue to as long as he puts in the work, which he clearly has no problem doing. He's one of the most talented and exciting fighters in the game right now, and on the edge of superstardom. He's only a few wins away from breaking Silva's record for most UFC wins in a row, and considering the track he's on right now, it won't be surprising if he gets there. Not bad for a guy who lost his first UFC fight and didn't look like he'd ever amount to much at all. Not bad at all, and it's further proof we have to be patient with young fighters, because you never know who they will turn into.